Still craving fresh, colorful foods in preparation for spring, I became inspired when I read this recipe for avocado and egg breakfast pizzas. That would be delicious for dinner, I thought. And why don’t I bump it up a notch and make full-fledged guacamole? 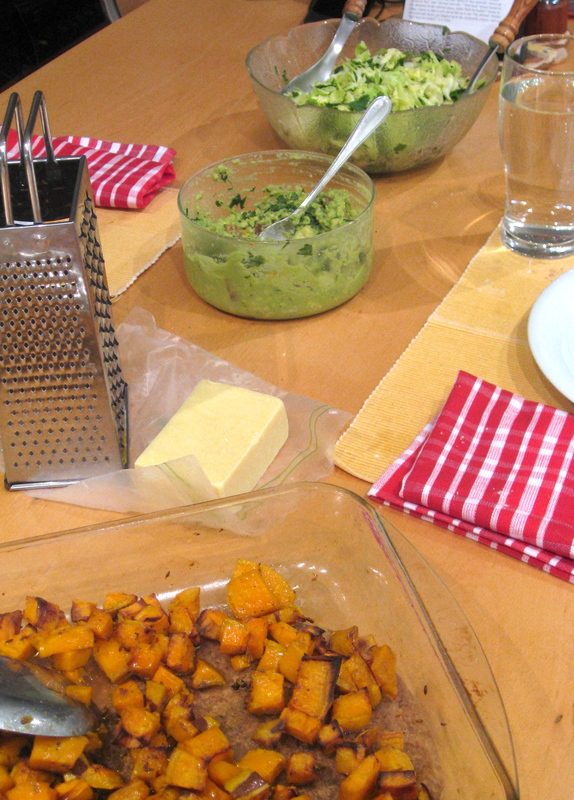 Then I thought that roasted sweet potatoes would beautifully complement the guacamole, both in color and taste. Sweet potatoes made me think of black beans. When all was said and done, it turned into a delicious Mexican pizza night. It was German Day so I said to F, “Das war genau, was ich wollte” — That was exactly what I wanted. Assemble separate components, put them all on the table, and create your personalized stack of deliciousness! Recipes and guidelines for guacamole, black bean-tomato sauté, pizza crust “tortillas,” roasted sweet potatoes, cabbage, and fried eggs follow. That’s right — this is an all-in-one post to help you create a fresh, healthy, and delicious Mexican meal with a twist. Feel free to get creative and throw in a twist or two of your own. Juice the citrus into a bowl. Scoop the flesh out of the avocado skins and add it to the bowl, then mash with a fork to your desired smoothness. Add all of the other ingredients, stirring vigorously to combine. Divide dough into four equal parts. On a floured surface, roll each part into a thin round. Pour a small amount of oil into a large skillet on medium-high heat. 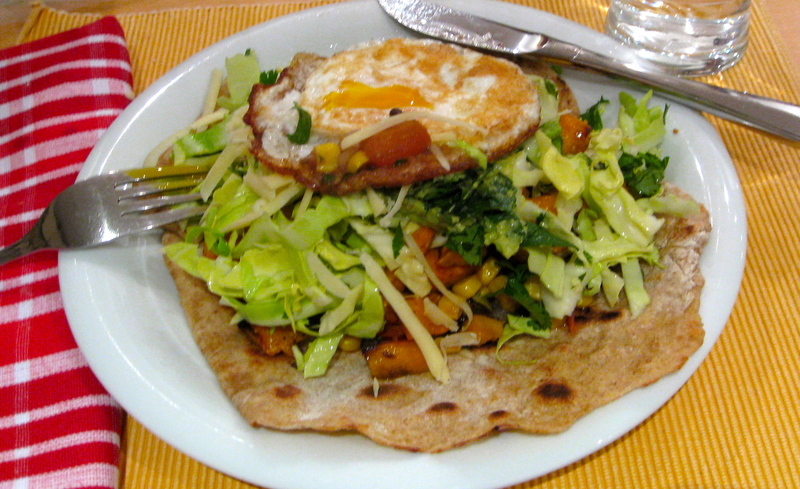 Put on one “tortilla,” and cook it for a few minutes, pressing it down if it bubbles up. Flip the round and cook for another minute or two. Repeat with the other rounds. Throw the onion and garlic in a small pot with some oil. Over medium-high heat, cook until the onion begins to soften. Add the tomato and cook for a few more minutes, until the tomato begins to break down. Dump in the rest of the ingredients and lower the heat. Simmer, stirring occasionally, until everything else is ready. Like with these roasted root vegetables, preheat the oven to 375F (190C), toss everything together in a baking dish, and roast for about an hour, stirring once or twice. Combine everything in a bowl and toss. Now you are ready to assemble your Mexican pizzas! Pile everything on top of your “tortillas” — we started with black beans, then sweet potatoes, then cabbage, then guacamole. For a little extra protein and flavor, top it all with some grated cheddar cheese and a fried egg. This entry was posted in culture, food, full meals, health, language, pictures, recipes and tagged Mexican, sweet potatoes on 07.03.2013 by taplatt. a breakfast pizza?!?!?!!!! LOVE that idea!! and I absolutely adore mexican food…so glad I found your blog! Thank you! We actually ended up eating these for dinner, but they’d make an amazing weekend breakfast/brunch. Thanks for reading my blog — I hope you find some other inspiring ideas.